This no cost cardboard toy is one of my sons favorite toys!!! Cardboard Toy and not making this a clutter item. Using dividers is a great way for sorting. Isaac enjoys this part as well. It is fun to see his system of putting things where he thinks they belong. This above picture, shows how I used a pipe cleaner to keep all the buttons, balls, dice etc inside the box and still allowed my little man to see it all. Seeing all the items drop down in was a big part of the fun for him. Playing with the cardboard toy. with his excitement of each function I created. Have you ever had a moment of complete ingenuousness. An idea that was perfect your family/kid etc maybe not ingenious for the whole human race but for little kiddo, well the drop box day was that day for me... I took action on an idea forming for some time and truly it was a super duper moment. My middle girl who is 5 had her turn at playing with Drop Box as well. The button slot are by far the favored item and function. If you choose to do this it will take you only a few minutes. Our Super Duper Cardboard Toy Drop Box is 3 months old and holding up great. 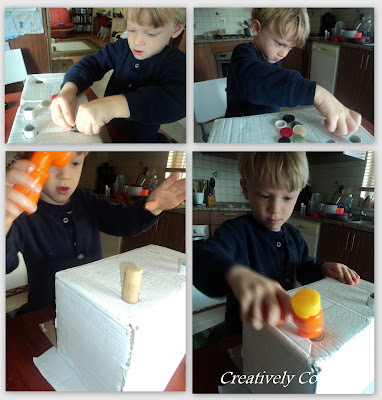 However this cardboard toy can be played with and then recycled easily because it is no cost and easy to make again. I actually put this toy up and get it out from time to time that has helped in keeping it in good shape I am sure. Make sure you get a box that is two ply or more so that it is sturdy enough for the pounding and consistent use. Instead of corks you could use the small pieces from Lincoln Logs. Becky - this is yet another brilliant idea! I wish I'd thought of all this a few years ago when my kids were younger! - mind you, they still love creating things out of cardboard boxes themselves!! Love it! I used to make similar toys for my kids, but never made anything quite this "professional!" Maybe my daughter and I will make it for a little friend! This is absolutely AWESOME! I love it! I might try it for my daughter. She's still putting stuff in her mouth, so a lot of these fun games have to be very very supervised. So cool! This is AWESOME!!! What a super fun, creative idea! Thanks so much for linking up to TGIF & I can't wait to see what you link up next!! Shiloh, I know this toy comes with lots of little parts...however BIG buttons work well. My son loves the big ones so that could help. Enjoy. What an original and fun toy to make. Thanks for sharing such a wonderful idea. Cheers! I just wanted to let you know I featured this at this week's linky party - http://livinglifeintentionally.blogspot.com/2011/12/tgif-linky-party-9.html - So pop on over, grab your Featured Button & don't forget to link up this week!! Thanks again for sharing your creativity with the rest of us!! I love this idea and will be making one of my own soon. I actually will probably have to make two because I'm sure both my sons will think it's great. Pinning this post for future reference. Thanks for sharing. This looks like so much fun! Thank you so much for sharing. That is so frugal and so creative! What a great way to re-purpose a box into a cool new toy! I will be making it for my little niece! Oh that is super cute! And looks like it is a lot of fun too! Brilliant!